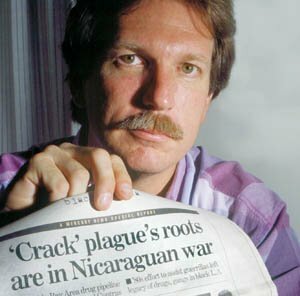 From the Archive: It’s been a decade since the big U.S. newspapers hounded journalist Gary Webb to suicide because he exposed their failure to stop one of Ronald Reagan’s worst crimes: drug trafficking by the Nicaraguan Contras. The sordid saga finally was told by a Hollywood movie, Robert Parry noted in October. The movie, “Kill the Messenger,” is forcing the mainstream U.S. media to confront one of its most shameful episodes, the suppression of a major national security scandal implicating Ronald Reagan’s CIA in aiding and abetting cocaine trafficking by the Nicaraguan Contra rebels in the 1980s and then the systematic destruction of journalist Gary Webb when he revived the scandal in the 1990s. Journalist Gary Webb holding a copy of his Contra-cocaine article in the San Jose Mercury-News. The New York Times and other major newspapers mocked the Contra-cocaine scandal when Brian Barger and I first exposed it in 1985 for the Associated Press and then savaged Webb in 1996 when he traced some of the Contra-cocaine into the manufacture of crack which ravaged American cities. So, when you’re watching this movie or responding to questions from friends about whether they should believe its storyline, you might want to know what is or is not fact. What is remarkable about this tale is that so much of it now has been established by official government documents. In other words, you don’t have to believe me and my dozens of sources; you can turn to the admissions by the Central Intelligence Agency’s inspector general or to evidence in the National Archives. Meneses was near the center of Webb’s 1996 articles for the San Jose Mercury-News, a series that came under fierce attack from U.S. government officials as well as major news organizations, including the New York Times, the Washington Post and the Los Angeles Times. The controversy cost Webb his career, left him nearly penniless and ultimately drove him to suicide on Dec. 9, 2004. But the bitter irony of Webb’s demise, which is the subject of “Kill the Messenger” starring Jeremy Renner as Webb, is that Webb’s much-maligned “Dark Alliance” series eventually forced major admissions from the CIA, the Justice Department and other government agencies revealing an even-deeper relationship between President Reagan’s beloved Contras and drug cartels than Webb (or Barger and I) ever alleged. Typical of the evidence that the Reagan administration chose to ignore was the document that I found at the National Archives, recounting information from Dennis Ainsworth, a blue-blood Republican from San Francisco who volunteered to help the Contra cause in 1984-85. That put him in position to witness the strange behind-the-scenes activities of Contra leaders hobnobbing with drug traffickers and negotiating arms deals with White House emissaries. “At the end of the cocktail party, Meneses and Calero went off together,” Ainsworth told U.S. Attorney Joseph P. Russoniello, according to a “secret” Jan. 6, 1987 cable submitted by Russoniello to an FBI investigation code-named “Front Door,” a probe into the Reagan administration’s corruption. The Reagan administration’s neglect of Ainsworth’s insights reflected the overriding hostility toward any information even from a Republican activist like Ainsworth that put the Contras in a negative light. In early 1987, when Ainsworth spoke with U.S. Attorney Russoniello and the FBI, the Reagan administration was in full damage-control mode, trying to tamp down the Iran-Contra disclosures about Oliver North diverting profits from secret arms sales to Iran to the Contra war. Only occasionally, such as when the George H.W. Bush administration needed witnesses to convict Panamanian dictator Manuel Noriega did the Contra-cocaine evidence pop onto Official Washington’s radar. In 1995, frustrated by the growing triviality of American journalism, and acting on the advice of and with the assistance of my oldest son Sam, I turned to a new medium and launched the Internet’s first investigative news magazine, known as Consortiumnews.com. The Web site became a way for me to put out well-reported stories that my former mainstream colleagues ignored or mocked. Secondly, the San Jose Mercury-News, which was the local newspaper for Silicon Valley, had posted documents and audio on its state-of-the-art Internet site. That way, readers could examine much of the documentary support for the series. It also meant that the traditional “gatekeeper” role of the major newspapers, the New York Times, the Washington Post, and the Los Angeles Times, was under assault. If a regional paper like the Mercury-News could finance a major journalistic investigation like this one, and circumvent the judgments of the editorial boards at the Big Three, then there might be a tectonic shift in the power relations of the U.S. news media. There could be a breakdown of the established order. In other words, Webb was right about the suspicion that the Contra movement had become less a cause than a business to many of its participants. Even Oliver North’s emissary reported on that reality. But truthfulness had ceased to be relevant in the media’s hazing of Gary Webb. The Big Three’s assault, combined with their disparaging tone, had a predictable effect on the executives of the Mercury-News. As it turned out, Webb’s confidence in his editors had been misplaced. By early 1997, executive editor Jerry Ceppos, who had his own corporate career to worry about, was in retreat. Ceppos was wrong about the proof, of course. At AP, before we published our first Contra-cocaine article in 1985, Barger and I had known that the CIA and Reagan’s White House were aware of the Contra-cocaine problem at senior levels. One of our sources was on Reagan’s National Security Council staff. However, Ceppos recognized that he and his newspaper were facing a credibility crisis brought on by the harsh consensus delivered by the Big Three, a judgment that had quickly solidified into conventional wisdom throughout the major news media and inside Knight-Ridder, Inc., which owned the Mercury-News. The only career-saving move career-saving for Ceppos even if career-destroying for Webb was to jettison Webb and the Contra-cocaine investigative project. After Volume One was released, I called Webb (whom I had spent some time with since his series was published). I chided him for indeed getting the story “wrong.” He had understated how serious the problem of Contra-cocaine trafficking had been, I said. As well as depicting a more widespread Contra-drug operation than Webb (or Barger and I) had understood, the Justice Department report provided some important corroboration about Nicaraguan drug smuggler Norwin Meneses, a key figure in Gary Webb’s series and Adolfo Calero’s friend as described by Dennis Ainsworth. But the CIA sought to discredit Cabezas at the time because he had trouble identifying Gomez’s picture and put Gomez at one meeting in early 1982 before Gomez started his CIA assignment. While the CIA was able to fend off Cabezas’s allegations by pointing to these minor discrepancies, Hitz’s report revealed that the CIA was nevertheless aware of Gomez’s direct role in drug-money laundering, a fact the agency hid from Sen. Kerry in his investigation during the late 1980s. Despite its drug ties to Matta-Ballesteros, SETCO emerged as the principal company for ferrying supplies to the Contras in Honduras. During congressional Iran-Contra hearings, FDN political leader Adolfo Calero testified that SETCO was paid from bank accounts controlled by Oliver North. SETCO also received $185,924 from the State Department for delivering supplies to the Contras in 1986. Furthermore, Hitz found that other air transport companies used by the Contras were implicated in the cocaine trade as well. On Oct. 10, 1998, two days after Hitz’s Volume Two was posted on the CIA’s Web site, the New York Times published a brief article that continued to deride Webb but acknowledged the Contra-drug problem may have been worse than earlier understood. Several weeks later, the Washington Post weighed in with a story that simply missed the point of the CIA’s confession. Though having assigned 17 journalists to tear down Webb’s reporting, the Los Angeles Times chose not to publish a story on the release of Hitz’s Volume Two. After his original “Dark Alliance” series was published in 1996, I joined Webb in a few speaking appearances on the West Coast, including one packed book talk at the Midnight Special bookstore in Santa Monica, California. For a time, Webb was treated as a celebrity on the American Left, but that gradually faded. But Webb never could overcome the pain caused by his betrayal at the hands of his journalistic colleagues, his peers. In the years that followed, Webb was unable to find decent-paying work in his profession, the conventional wisdom remained that he had somehow been exposed as a journalistic fraud. His state job ended; his marriage fell apart; he struggled to pay bills; and he was faced with a forced move out of a house near Sacramento, California, and in with his mother. I told the reporter that American history owed a great debt to Gary Webb because he had forced out important facts about Reagan-era crimes. But I added that the Los Angeles Times would be hard-pressed to write an honest obituary because the newspaper had ignored Hitz’s final report, which had largely vindicated Webb. The rehabilitation of Webb’s reputation and the correction of this dark chapter of American history now rest on how the public responds to the presentation of Webb’s story in the film, “Kill the Messenger.” It’s also unclear how the Big Media will react. In early October, New York Times’ media writer David Carr continued some of the old quibbling about Webb’s series but did acknowledge the Contra-cocaine reality. Thankyou yet again, Robert Parry; not only for this extraordinary testiment to your respect and loyalty to Gary Webb and his legacy of courageous investigative journalism, but for your own relentless efforts to speak truth to those of us who too often settle for far too less.